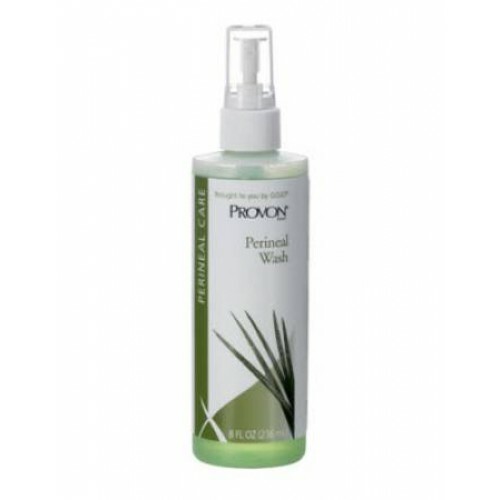 The Provon® Perineal Wash by Gojo is a gentle cleanser in the Provon® line that specifically addresses skin cleansing needs for those with incontinence. The Perineal Wash is a no-rinse solution for daily incontinence cleaning, which can save time and effort. It comes equipped with an easy spray-nozzle to cover a large skin area and can be gently wiped away with a soft, clean absorbent cloth. The spray has a light herbal scent and comes in an 8oz bottle. The solution comes with added moisturizers Aloe and Vitamin E to leave affected skin areas soft and without irritation from repetitive cleaning. Though soft of skin, it's tough on removing urine and feces as well as other bacteria-containing impurities and body fluids. The Provon® Perineal Wash comes in liquid form, light green in color and is pH balanced. There's no need to rinse solution -- just wipe away to clean. It includes light, herbal scent. Wash cleans and moisturizes with Vitamin E and Aloe Vera. It's a great daily perineal cleanser to clean urine and feces. Spray nozzle makes for easy application and covers affected skin quickly. Solution is reads between a 5 to 8.8 pH. Provon is easy to use. It gets rid of all the oder and leaves a slight fresh scent behind. The product is amazing.